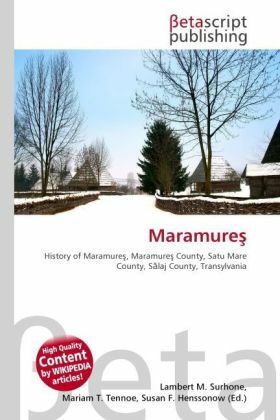 Maramure is a geographical, historical and ethno-cultural region in northern Transylvania, along the upper Tisza River; it covers the Maramure Depression and the surrounding mountains that form part of the northeastern Carpathians. The territory in its southern section is now part of Maramure County in northern Romania; its northern section is part of Zakarpattia Oblast of western Ukraine. Alternatively, the name Maramure is used for the Maramure County of Romania, which contains the southern section of the former historical region and also small parts of the interbellic Satu Mare County and S laj County.Maramure is a valley totally enclosed by mountains, Oa , Gutâi, ible and Rodnei to the west and south, Maramure Mountains and Carpa ii P duro i to the east and north, with a thin opening at Khust, with several dozen small mountain rivers and creeks flowing into the river Tisza (Tisa). It is forested and not easily accessible. The limits of the region is between the parallels of 47o33' N and 40o02' N and the meridians of 23o15' E and 25o03' E. Maramure represents one of the largest depressions in the Carpathians, covering an area of about 10000 km².